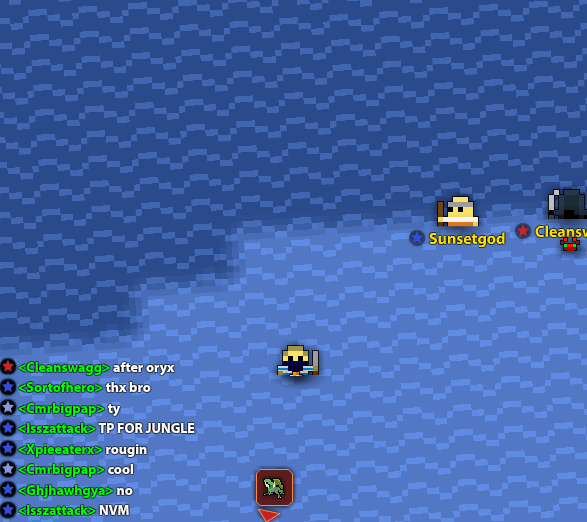 Players take a break from fighting in the water in the ocean of a realm. Water is known for slowing players down, and this can be extremely annoying when battling the Ghost Ship or the Hermit God. Well, it is water! What do you expect? A good strategy at the Ghost Ship is to clear the surrounding area (go to the edge of the pool and off-center) to make sure no gods catch you slowed! Enemies are not affected by water. Only the water on the shore of the ocean moves to make waves! You can sometimes see non-moving water in the ocean which is just the end of a river.